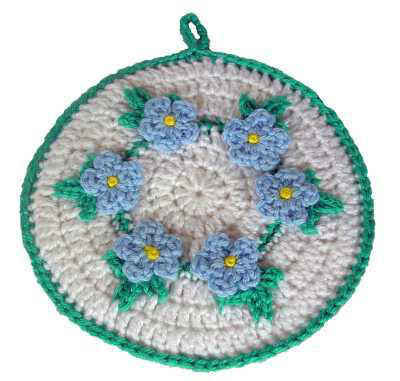 GAUGE: Assembled Snowflake and Motif = 4” (10 cm) in diameter. CHECK YOUR GAUGE. Use any size hook to obtain the gauge given. 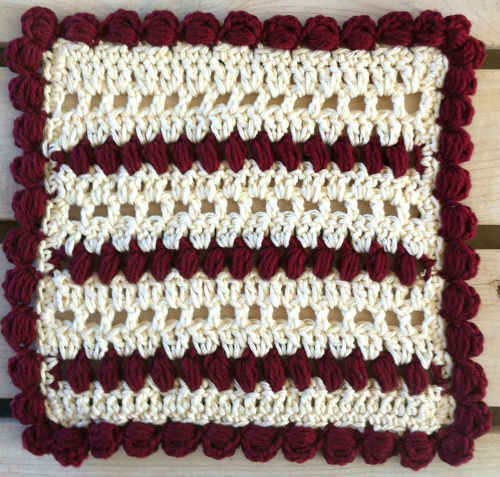 Double crochet four together (dc4tog): [Yarn over, insert hook in next stitch and draw up a loop, yarn over and draw through 2 loops on hook] 4 times, yarn over, draw through all 5 loops on hook. Double crochet two together (dc2tog): [Yarn over, insert hook in next stitch and draw up a loop, yarn over and draw through 2 loops on hook] twice, yarn over, draw through all 3 loops on hook. V-stitch (V-st): (Dc, ch 1, dc) in same st.
Snowflakes are made first and then attached to backing motifs by working through both thicknesses at the same time while working Round 4. Motifs are then assembled into strips with strip border worked around entire strip. Strip edging is then added to each side of strip. Strips are then sewn together and border is worked around entire outer edge. With D, ch 3, join with slip st to form ring. Round 1 (right side): Ch 1, 16 sc in ring; join with slip st in first sc – 16 sc. Round 2: *Ch 6, (slip st, [ch 3, slip st] twice) in 4th ch from hook, ch 3, slip st in each of next 2 sts; repeat from * around, placing last slip st in same st as beginning ch-6 – 8 rays. Fasten off. With first color, ch 3, join with slip st to form ring. Round 1 (right side): Ch 3 (counts as dc here and throughout), 15 dc in ring; join with slip st in top of beginning ch-3 – 16 dc. Round 2: Ch 1, sc in first st, ch 1, (sc, ch 1) in each st around; join with slip st in beginning sc – 16 sc; 16 ch-2 spaces. Round 3: Ch 4 (counts as dc, ch 1), dc in same st (counts as first V-st), V-st in each sc around; join with a slip st in 3rd ch of beginning ch-4 – 16 V-sts. Fasten off. Round 4 (joining Snowflakes): With right side of Motif facing and Snowflake on top of Motif with right side facing, working through double thickness, join F with sc in any ch-3 space on Snowflake and any ch-1 space on Motif, 2 sc in same space, 3 sc in next ch-1 space on Motif only, *3 sc in next center ch-3 space on Snowflake and ch-1 space on Motif at the same time, 3 sc in next ch-1 space on Motif only; repeat from * around; join with slip st in first sc – 48 sc. Fasten off. Round 5: With right side facing, working in back loops only and following Assembly Diagram for color choice; join yarn with sc in first st of last round, (sc, ch 1, sc) in next st, *sc in each of next 5 sts, (sc, ch 1, sc) in next st; repeat from * 6 times, sc in each of last 4 sts; join with slip st in first sc – 56 sc; 8 ch-1 spaces. Fasten off. Following Assembly Diagram, sew 10 Motifs together across 7 sts between any 2 ch-1 spaces. Round 1: With right side facing, join A with sc in top right hand corner ch-1 space at one end of Strip, (ch 1, sc) in same space, place marker in this ch-1 space, **[skip next st, working in back loops only for all sts except when working in ch-1 spaces, sc in next 5 sts, skip next st, (sc, ch 1, sc) in next ch-1 space] 3 times, *skip next st, sc in next 4 sts, dc4tog in next 2 sts on current Motif and next 2 sts on next Motif, sc in each of next 4 sts, skip next st, (sc, ch 1, sc) in next ch-1 space, skip next st, sc in next 5 sts, skip next st, (sc, ch 1, sc) in next ch-1 space; repeat from * 9 times, skip next st, sc in next 5 sts, skip next st**, (sc, ch 1, sc) in next ch-1 space, repeat from ** to ** once; join with slip st in first sc – 360 sc; 18 dc4tog. Fasten off. Round 2: With right side facing, join B with sc in marked ch-1 space, (ch 1, sc) in same space, move marker up to this ch-1 space, **[skip next st, sc in each of next 5 sts, skip next st, (sc, ch 1, sc) in next ch-1 space] 3 times, *skip next st, sc in next st, hdc in next st, dc2tog over next 2 sts, tr in next st, dc2tog over next 2 sts, hdc in next st, sc in next st, skip next st, (sc, ch 1, sc) in next ch-1 space, skip next st, sc in each of next 5 sts, skip next st, (sc, ch 1, sc) in next ch-1 space; repeat from * 9 times, skip next st, sc in next 5 sts, skip next st**, (sc, ch 1, sc) in next ch-1 space; repeat from ** to ** once; join with slip st in first sc – 344 sts. Fasten off. Round 3: With right side facing, join C with sc in marked ch-1 space, (ch 1, sc) in same space, move marker up to this ch-1 space, *[skip next st, sc in next 5 sts, skip next st, (sc, ch 1, sc) in next ch-1 space] twice, *skip next st, sc in next 5 sts, skip next st, sc in next ch-1 space, dc in next st, dc2tog, dc in next 3 sts, dc2tog, dc in next st, sc in next ch-1 space*; repeat from * to * 9 times, [skip next st, sc in next 5 sts, skip next st, (sc, ch 1, sc) in next ch-1 space] 4 times, repeat from * to * 9 times, skip next st, sc in each of next 5 sts, skip next st, (sc, ch 1, sc) in next ch-1 space, skip next st, sc in each of next 5 sts, skip next st; join with slip st in beginning sc – 274 sts. Fasten off. Round 4: With right side facing, join F with sc in marked ch-1 space, (ch 1, sc) in same space, [sc in each st across to next ch-1 space, (sc, ch 1, sc) in next ch-1 space] 3 times, mark last st, *(sc, ch 1, sc) in next ch-1 space, sc in each st up to next ch-1 space; repeat from * around, join with slip st in first sc – 288 sts. Fasten off. Row 1: With right side facing, working in back loops only, join A with slip st in marked st, ch 3 (counts as dc), remove marker, dc in each st across to next ch-1 space; do not turn – 134 dc. Fasten off. Row 2: With right side facing, working in back loops only, join C with sc in first st, sc in each st across; do not turn – 134 sc. Fasten off. Row 3: With right side facing, join B with sc in first st, sc in each st across; do not turn – 134 sc. Fasten off. Repeat Strip Edging in other long side of Strip. Matching up sts of last row of strip edging, whipstitch strips together through back loops only. Round 1: With right side facing, join F with sc in last st of last row of Strip Edging on either long side, 4 sc in same st, sc in each row-end st across Strip Edging, *[sc in each st across to next ch-1 space, (sc, ch 1, sc) in next ch-1 space] twice, sc in each st across to next Strip Edging, sc in each row-end st of Strip Edging*; repeat from * to * 4 times, working in sts down long edge, 4 sc in first st, sc in each st across to last st, 5 sc in last st, sc in each of next 2 row-end sts; repeat from * to * 5 times, working down opposite long edge, 4 sc in first sc, sc in each st across to beginning; join with slip st in first sc. Fasten off. Round 2: With right side facing, join A with sc in same st as joining, sc in next st, *3 sc in next st, sc in next 2 sts, dc4tog, ch 1, sc in next 7 sts, skip next st, [3 sc in next ch-1 space, skip next st, sc in next 8 sts, skip next st, 3 sc in next ch-1 space, skip next st, sc in next 8 sts, dc2tog, sc in next 4 sts, dc2tog, sc in next 8 sts, skip next st] 4 times, 3 sc in next ch-1 space, skip next st, sc in next 9 sts, skip next st, 3 sc in next ch-1 space, skip next st, sc in next 8 sts, dc4tog, ch 1, sc in next 2 sts, 3 sc in next st, sc in each st up to next 5-st corner group, sc in next 2 sts; repeat from * to end, join with slip st in first sc. Fasten off. 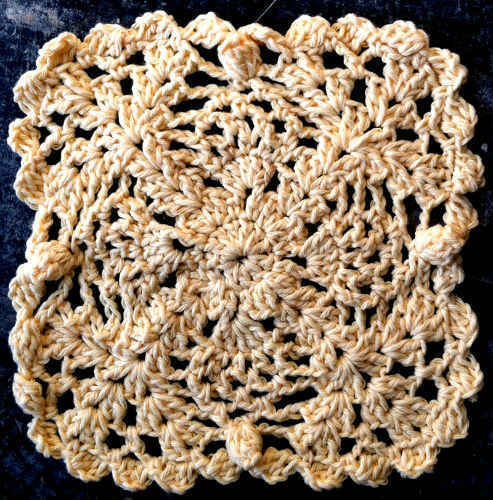 ch = chain; dc = double crochet; sc = single crochet; st(s) = stitch(es); tr = triple crochet; ( ) = work directions in parentheses into same st; [ ] = work directions in brackets the number of times specified; * = repeat whatever follows the * as indicated.